In South Africa, most of the adults who spend time with children in their various capacities, including parents, teachers, caregivers, adopters and custodians, do not regularly read aloud to them. And even if they do, with repeated readings of favourite storybooks, most can’t sustain the activity long enough for it to become a habit. This is because if they choose to read in a mother tongue other than English, after a month or so they deplete the available supply of books. In South Africa, it is only printed stories in English that published prolifically – a critically important point to stress. This leaves aside, for now, all the questions about the choice and availability of widely ranging and enticing stories. 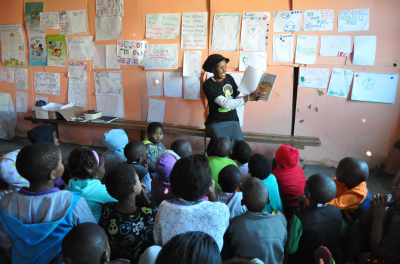 Many publishing companies and initiatives are addressing these language limitations, including the Nal’ibali reading-for-enjoyment campaign in which I perform a role. But even having stories in relevant languages does not mean that adults will automatically reach for them to read with their children, nor does it mean they know how to. Firstly, reading is a habit that matures over time, and coming to know which books to select is a kind of apprenticeship. We develop from being novices to more experienced readers. The historical fact is that African languages have been systematically denied their place in writing literature – and many adults are not leisure readers. Without a personal inner library of stories, what does an adult have to offer a child who is looking for guidance (I mean an adult who can read but doesn’t)? This is the position of many adults who are the custodians of children’s formal or informal education in South Africa. Some simply don’t know what stories to choose or why they would choose one over another. Some also have little, if any, practice in reading aloud. It is a kind of skill that is often assumed to “just exist” – but it doesn’t. Practice makes perfect. Large numbers of adults involved in early literacy education also tend to hold children to the dictum “Learn to read, then read to learn”, focusing their gaze and attention on combining letters and sounds that lead tidily to easily decodable words and phrases in mother and/or other tongues. If, and when, our eager young learners, brimming with potential and interest, master this arid feat, they’re inched up to the next level of more challenging but still controlled texts. Reading to children is important in early literacy education’s official curriculum, but its priority is delivering a carefully managed process to children so that the books they learn to read with are “just right” and not too easy or too hard. This works for some children, but it does so often because somewhere else – at school or at home, or in a reading club – they have other literacy lessons that show them the value of reading. These are the kinds of authentic, messy forays into print, stories and books that unleash children’s imaginations and bring them the joy and satisfaction that great stories offer. It is these kinds of personally satisfying experience that teach us what reading is really about and lead to invaluable reading habits. More and more adults are now beginning to wake up to the power they wield when they read stories to their children: they are offering them the benefits of this superbly nutritious brain food. Great stories weave magic. Our hearts beat as fast when we identify with fictitious characters suffering hardship and indignity as when we are empathising with our real friends and family. We feel their pain and their glory. And we now know from research why this is so. Brain scans show how narrative stimulates many other parts of our brains, not just the “language regions”, which we’ve known about for some time. Brain areas dealing with smell, for instance, are activated when we read evocative words such as “jasmine” or “petrol”. In laboratories, scientists can see how reading phrases involving texture metaphors light up our sensory cortex, which enables it to perceive touch. So “his leathery hands” and “her velvet voice” evoke responses that “his strong hands” and her “pleasing voice” do not. This suggests that our brains do not operationally distinguish between our reading about an experience and personally having it. Our basic brain functions can’t tell the difference between a real event and one in a story – and voluminous research suggests that this capacity of stories predates language. The possible worlds that fiction conjures up, especially those replete with moral quandaries, metaphors and finely spun descriptions of others, allow us to experience so much more than we can when our experience is restricted to our own lives. With stories, we weigh up our values and consider what our actions would be if we were in the shoes of others. And those of us who grew up with the great stories from around the world are stronger when fearful, in danger or abandoned in a time of need, because we have the decisions and actions of inspiring characters and heroes to draw on. So, although reading aloud to children will not magically rocket them to the top of the school ladder, there is much evidence to suggest that reading aloud to children will help them develop excellent memories and vocabularies, think critically and logically, and help their comprehension skills to soar. Even more impressive is that it will help them grow up as people who engage with the world in ways that are empathetic, critically analytical and full of curiosity. by Carole Bloch, Director of The Project for the Study of Alternative Education in South Africa (PRAESA), which is driving the Nal’ibali reading-for-enjoyment campaign. For more information, visit www.praesa.org.za or www.nalibali.org. I attended a very informative Nal’ibali training in Grahamstown last week with the lovely Malusix2! I loved the ideas shared, and I was particularly struck by the importance of building up the personal story bank. I thoroughly enjoyed the fun ideas and easy ways to stimulate others to develop and value their own stories. All power and elbow grease to the team! As I sit here thinking of the stories of my childhood, I hear my ever be-jeweled, rose-fragranced grand-mama whispering in her palest-of-pink-voices into my eager and curious ear… thank you for the memories.